What do you think of when you hear the word “infrared”? Did you know that thermal imaging can be used for finding moisture in roofing and building envelopes, building heat/cooling loss studies, electrical issues, mechanical issues and for helping to locate inflammation and other anomalies in horses? Yes…horses. It’s also being considered as an alternative to mammograms. 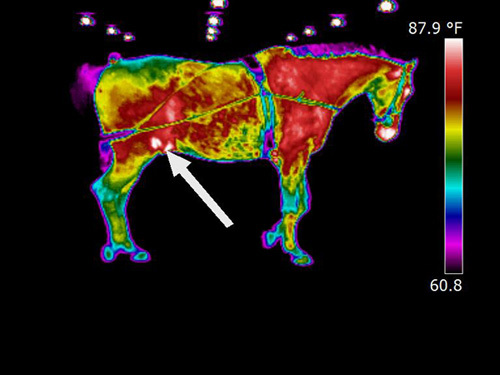 Thermal imaging is used to locate inflammation and other anomalies in horses. The benefits of thermal imaging have not gone untapped for the construction, facilities maintenance and roofing industry of late. 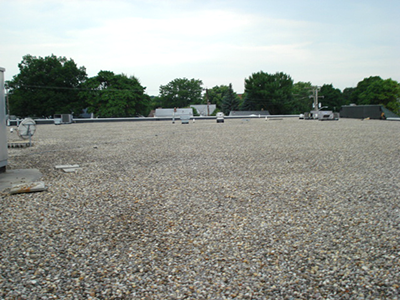 In the roofing industry specifically, infrared can help locate wet insulation in most flat roofs as well as helping to narrow the search for a possible leak source. 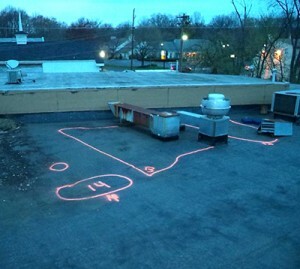 Infrared can help locate wet insulation in most flat roofs as well as helping to narrow the search for a possible leak source. Infrared scanning is an excellent tool to help find problem wet areas in roofing systems. This allows for substantial costs savings for roof replacement projects since tear-off may be minimized to select areas rather than the entire roof system. Both of which can save you money. Thermal scans of your roof system can quickly and accurately evaluate the health of your roof without the need for destructive testing. 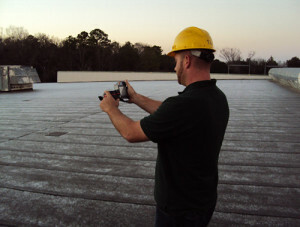 Thermal imaging is also more cost effective than other traditional roof evaluation methods. Save money on your next roof replacement project or energy costs. Request a roof thermal image scan today! Request a Roof Thermal Scan! Request a Roof Thermal Imaging Scan today! Moisture trapped in your roof system can rust or rot your roof deck compromising the structural integrity of your roof. Rotted or rusted roof decks caused by unseen trapped moisture can pose a serious safety issue for workers walking on the roof surface. Water intrusion in your roof system can also lead to interior damage from leaks and can impact critical electrical and mechanical systems in your building. 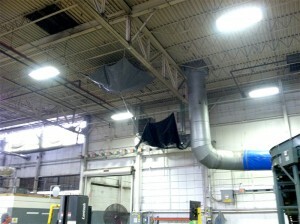 Roof leaks can also damage inventory as well as negatively impacting operations. Trapped moisture in your roof system can also lead to the formation of mold. Roofs are costly to replace. Regular infrared scanning of your roof is a cost-effective way to monitor the health of your roof and address issues as soon as possible while they are still relatively easy to repair such as wet insulation remediation. Wet roof insulation conducts thermal energy better than dry insulation driving up your building’s heating and cooling costs. Many roofing manufacturers now require regular thermal imaging of your roof system to protect your warranty. They also understand the great benefits of thermal imaging for your roof system in order to protect your investment. Thermal imaging detects heat held by moisture in the roofing system, thereby creating a difference in the radiant heat loss after heat gain stops which allows for the detection of potential moisture. This moisture takes longer to cool than the rest of the roof system and can be seen with the infrared imager. The infrared imager detects heat patterns across surfaces by detecting infrared heat being emitted by an object and converting it to visible light. Infrared imagers “see” the heat radiated from your roof surface and surrounding equipment in real time. This is similar to how a video camera sees visible light in real time. The infrared imager detects heat patterns across surfaces by detecting infrared heat being emitted by an object and converting it to visible light. One word of caution before you dive into hiring a contractor to perform a thermal scan of your roof. There are certain necessary conditions needed to ensure a successful thermal scan of your roof. If the conditions are not correct it can render the scan useless. Thermal roof imaging works by reading temperatures of the roof surface and therefore needs to be performed during the right conditions to ensure an accurate reading. Warm weather scans use thermal imaging to read the difference in temperature between wet and dry roof insulation. These types of roof moisture surveys are performed during warm weather after the sun has set. 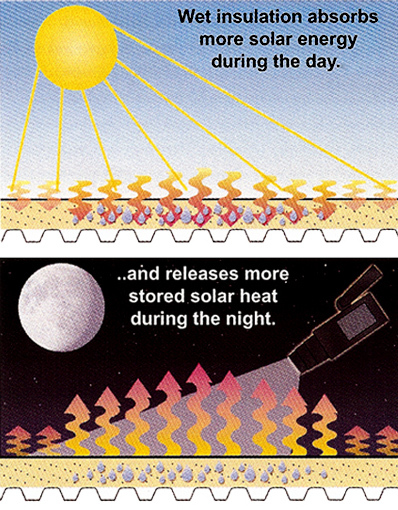 As the sun heats the roof during the day it also heats the wet insulation. After the sun has set and the dry portions of the roof begin to cool, these wet areas will hold the heat and that’s when you begin to see these areas as “hot spots” with a thermal imager. Cold weather scans are done during cold weather or possibly early morning throughout the year. This type of survey is based on the difference between indoor and outdoor temperatures. Since wet roof insulation has a higher thermal conductivity than dry insulation when the inside of the building is warmer than the air outside the wet insulation will transfer more heat out of the building than dry insulation. The moisture meter is another tool used in conjunction with thermal imaging in order to confirm the presence of moisture. A thermal imager alone cannot verify the existence of moisture; it works more as a guide to read the thermal signature of the roof surface to discover the areas where it appears there is moisture. 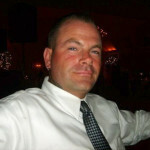 It still requires a certified technician to in fact verify and locate the exact area. There are 2 types of moisture meters – penetrating and non-penetrating. Penetrating moisture meters have one or a series of pins that probe into the surface of the roof to capture the moisture content values. 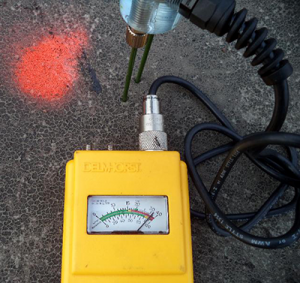 They tend to sometimes be more accurate than non-penetrating meters but they also do just what they say, penetrate the roof surface which will then need to be repaired. Non-penetrating moisture meters are non-invasive and will not create damage to the roof surface. They contain a series of sensors that measure the moisture levels through the system. Even though they may not be as accurate as the penetrating moisture meter, they are still very accurate and can verify moisture in a roof system without penetrating the surface. As effective as thermal imaging can be it does have its limitations. Variable weather conditions and differences between types of roof systems can render these scans ineffective. It’s important to have a certified technician to help ensure the scan is effective. Issues such as lack of solar load, high winds and heavy dew make it difficult to detect thermal patterns within a roof. As far as roof types, heavily ballasted roof systems are not a good candidate for thermal imaging along with roof systems containing more than one layer of insulation. Also inverted membrane roofs are not typically inspected with thermal imaging. Moisture meters also have limitations. EPDM roof membranes have a high carbon content which registers them as wet on the non-penetrating meter. Ballasted roof systems are not a good candidate for thermal imaging. Infrared can be used with EPDM but confirming the areas that may contain moisture may need to be completed with a penetrating moisture meter. Again it’s important to hire a competent and certified thermographer to complete your roof moisture scan. Make sure your technician is certified by a credible institute such as Infraspection Institute. Our highly trained and certified thermal imaging technicians will ensure you bet the most out of your roof thermal image scan. Contact us today!